The BMW Motorrad 4-cylinder combines superior power with sporty understatement. And a striking set of technical data, too. 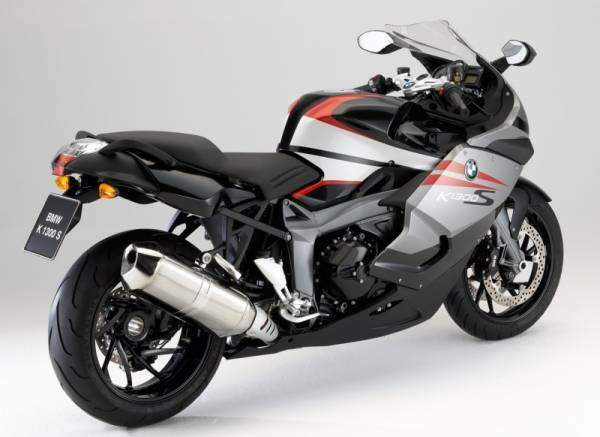 What the new inline 4-cylinder in the BMW K 1300 S, R and GT models has to offer is truly impressive. Punctually for the 25th anniversary of the K Series, BMW Motorrad is presenting three new peak performers in the “Champions’ League”. 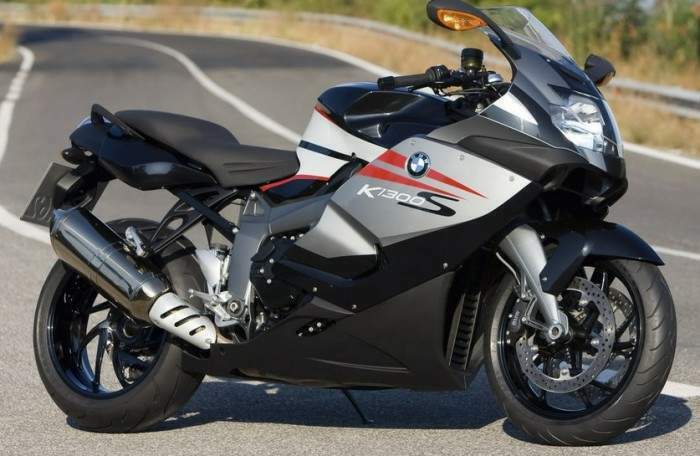 Power has a new face: BMW K 1300 S.
The new jet of the range boasts top specifications inside and out. As impressive as its top speed may be, it already delivers its power a lot earlier, from standstill so to speak. In the lower and middle rev range, where more than 80% of road riding takes place, this engine really packs a punch. And you’ll feel it straight away: 140 Nm from 1,293 cc. The 175 bhp delivered at 9.250 rpm are of course also very welcomed by all speed freaks. Compared to the performance category the 4-cylinder is very restrained when it comes to fuel consumption and emissions. New digital engine electronics settings as well as a newly designed exhaust system with hexagonally shaped silencer and electronically controlled flap control including 3-way catalytic converter are the reasons. Once again BMW Motorrad shows how modern engines should be built. The fact that they also produce a throaty sound is a great sign for the combination of common sense and emotion. You’ll find a lot of that in the design of the K 1300 S, too. Compared to her predecessor she has become slimmer, the aerodynamic, 18 mm narrower fairing top section just being one of a whole series of visual alterations which make it a completely unmistakeable and absolutely dynamic motorcycle. The driveline offers maximum traction in line with the motorbike’s sporty dynamics. The maintenance-free shaft drive, which is still unique in this class, with new two-level cardan shaft operates on the other side of the gearbox which has also been adapted to the engine’s power and shifts extremely smoothly. The rear wheel features the new dimensions 190/55. For especially sporty shifters there is a very special optional extra – an automatic shifter. You no longer need to use the clutch when shifting up – just slam in the gears! The Duolever front wheel guidance - introduced in the BMW K 1200 S - with its newly designed lower longitudinal strut, safeguards even higher riding precision and maximum riding stability. The firm spring/damper settings give the rider perfect road feedback. Optimum chassis geometry, central mass distribution and a constructionally designed low centre of gravity result in an absolutely harmonious overall package which offers handling and balance which are simply thrilling in this class. Performance has been increased even further. 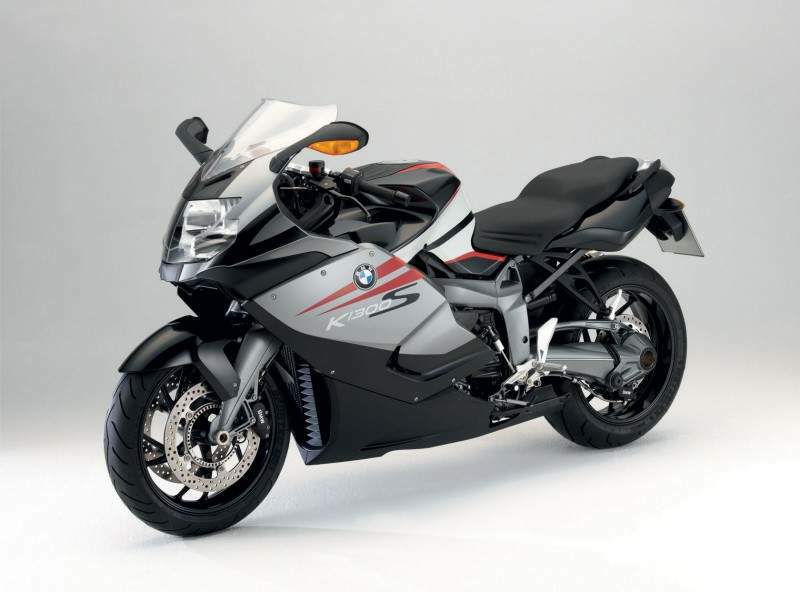 For the K 1300 S the ESA II option is available, the electronically adjustable 2nd generation suspension. The spring base, spring rate and damping are synchronised – automatically. This innovation means you can set your suspension with the press of a button, no matter how heavily laden you are. ABS is standard on this model, the ASC Automatic Stability Control is available as an option. It’s no news that a BMW offers the best seating position around but nevertheless it is still something special. Only if you have a well-balanced seating position can you ride both comfortably and actively. Or in other words just fast. The controls are also a major factor when it comes to ergonomics. In the new K models the new generation of switches for all coming BMW motorcycles has been introduced for the first time. Ergonomics have been optimised, space requirements have been reduced and MID technology* has been introduced. In short – the controls simply feel and look better. And should you feel like clocking up some laps on the racetrack and want your information presented in motorsports style, you can order the optional 2D-dashboard presented for the first time in the BMW HP2 Sport. Digital racing thrills! *Moulded Interconnect Design, printed circuits in the switch unit instead of individual wiring. Even more dynamic performance, particularly at lower and medium engine speeds, thanks to the increase in engine capacity. Engine output 129 kW (175 hp) at 9,250 rpm, maximum torque 140 Newton-meters (103 lb-ft) at 8,250 rpm. Fulfillment of the strictest environmental standards through newly harmonized Digital Motor Electronics. Optimized cylinder charge cycle for even better performance on less fuel. Optimized exhaust system with a new rear muffler and electronically controlled flap management plus a fully controlled three-way catalytic converter. Desmodromic operation improving the dosage of gas and engine power. Even greater riding precision combined with maximum riding stability ensured by optimized Duolever front wheel suspension with new set-up of the lower longitudinal arm. Firmer spring/damper set-up for even better feedback. Supreme handling provided by optimized suspension geometry, optimum mass distribution and a fully harmonized all-round concept. Perfect balance thanks to the low centre of gravity. Ergonomically balanced seating position for a relaxed but active style of riding. Electronically adjustable second-generation ESA II suspension and ASC Anti-Spin Control as an option. New, innovative generation of switches with optimised ergonomics. High standard of active safety provided by integral ABS (semi-integral) featured as standard. On-board network; CAN-bus technology for superior function with a smaller number of cables and low weight. Electronic immobilizer featured as standard. HP Gearshift Assistance for shifting up without the slightest interruption of power as special equipment. Wide range of standard features and special equipment tailored to the K 1300 S with the usual high standard offered by BMW. The second generation of BMW Motorrad’s four-cylinder power units has been upgraded and updated in the interest of even more power and performance, extra torque, and supreme riding dynamics. Displacement of the four-cylinder inline power unit in the K 1300 S is up by 136 cc from 1,157 cc to 1,293 cc. Maximum output is 129 kW (175 hp) at 9,250 rpm, maximum torque of 140 Newton-meters or 103 lb-ft comes at 8,250 rpm. In absolute figures, this is an increase in engine output by 6 kW (8 hp) and an increase in peak torque by 10 Newton-meters (7.4 lb-ft). 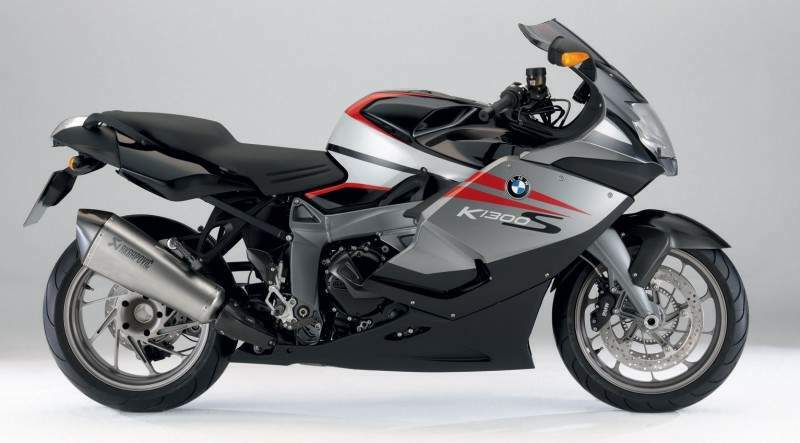 While the former K 1200 S had to be revved up to 10,250 rpm to develop its maximum output, the power unit of the new K 1300 S develops its maximum power at a relatively low 9,250 rpm. A further significant advantage is that more than 70 per cent of the engine’s maximum torque is available from just 3,000 rpm, with 10 Newton-meters or 7.4 lb-ft more torque available all the way from 2,000–8,000 rpm versus the K 1200 S.
The objective in developing the new model was obviously to enhance the already high standard of riding dynamics and sporting characteristics through power and performance easy to handle at all times. And weighing 82.8 kilos/182.6 (K 1200 S: 81.3 kilos/179.3, in each case including the clutch, gearbox and oil), the upgraded power unit of the K 1300 S remains one of the lightest engines of its size in the market. Like the previous model, the K 1300 S benefits above all from its carefully conceived overall configuration as well as the space-saving arrangement of ancillary units and the integrated gearbox. In all, this makes the entire drivetrain very compact, with ideal concentration of all masses in the middle of the machine. And as on the K 1200 S, the overall width of the power unit, measured on the level of the crankshaft, is 430 millimeters or 16.9". The perfect interaction of technical solutions and optimum integration of the engine and running gear already featured on the K 1200 S is fully retained on the K 1300 S.
In the process of upgrading the power unit of the K 1300 S, the engineers at BMW Motorrad have given particular emphasis to supreme riding qualities. Hence, the combustion chambers on the four-cylinder, the intake camshaft angle and the valve timing as well as the stroke of the outlet valves have been modified accordingly, with the outlet valve springs being re-set from the ground up. Running in anti-friction bearings, the connecting rods are extra-light forged components made of heat-treated steel. Measuring 119 millimeters or 4.68" in length (K 1200 S: 120 mm/4.72"), they keep lateral forces acting on the pistons to a minimum and guarantee superior engine refinement despite the longer stroke. Together with their anti-friction bearings, the conrods weigh just 404 grams (K 1200 S: 413 grams). In usual BMW style, the upper conrod opening comes with a bearing bush conceived for a service life of more than 100,000 kilometers or 61,000 miles. Newly developed lightweight box-type pistons measuring 80 millimeters or 3.15" in diameter, with a short piston apron and two slender piston rings optimized for minimum friction as well as a slender oil scraper ring, serve to increase cylinder stroke and, accordingly, the capacity of the engine. 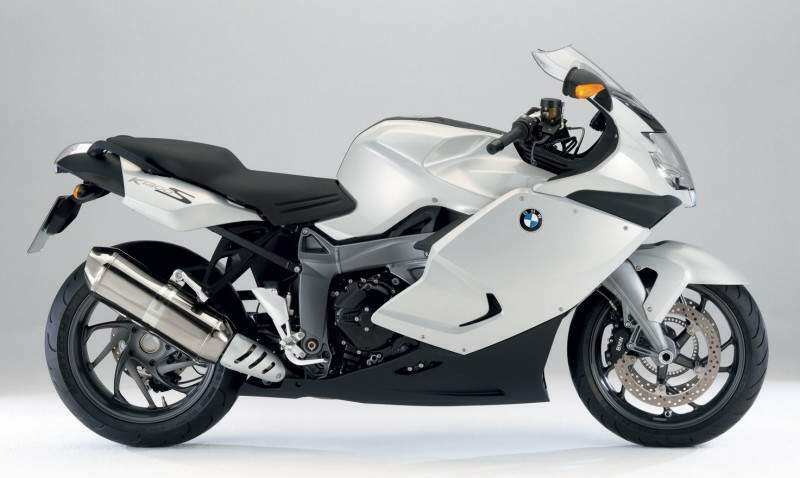 BMW K 1300 S in Granite Grey Metallic/Light Grey Metallic with Magma Red highlights. The balance shafts turn twice as fast as the crankshaft. To minimize any noise or sound waves generated in the process, the balance weights are connected to the balance shafts by means of elastomer units. Split horizontally along the middle of the crankshaft, the cylinder crankcase is made of a high-strength aluminum alloy. Made of a die-casting, the compact upper section forms an extra-stiff composite unit comprising the four cylinders and the upper bearing support for the crankshaft. The K 1300 S features dry sump lubrication introduced on the K 1200 S and proven over many years – the same technology as is largely used on racing engines. Apart from superior operating qualities and reliability even under extreme conditions, dry sump technology quite unique in this segment keeps the crankcase low and flat and therefore ensures a low position of the engine and a low centre of gravity. By leaving out the usual oil sump, the entire engine may be fitted 60 millimeters or 2.36" lower down than a conventional power unit. The oil reservoir comes in a tank fitted in the frame triangle behind the engine. A dual oil pump operating at the rear of the crankcase and driven by a chain from the clutch shaft draws in lubricant from the oil reservoir and feeds the compressed oil first to the oil filter (main flow filter). Easily and conveniently accessible from outside, the oil filter is positioned on the lower left side of the crankcase. From there the compressed oil flows into the main oil pipe in the crankcase and is spread out through internal holes to the lubricating points. The oil flowing back, in turn, gathers at the lowest point in the crankcase formed by a bulge in the lower lid. The second pump then delivers the oil flowing back first to the oil cooler and from there to the oil tank, forming a reflow system patented by BMW. The larger oil cooler is integrated beneath the headlight in the aerodynamically optimized front fairing for superior aerodynamics. In the interest of consistent lightweight technology, finally, the oil cooler pipes are made of aluminum. The oil level is checked conveniently and easily by means of a transparent plastic pipe at the outside of the oil reservoir. This patented hose-like pipe also serves to drain oil from the tank during maintenance. Capacity of the oil tank is 4.2 Litresor 0.92 imp gals. An oil level warning system is available as an option in conjunction with the likewise optional on-board computer. To keep the engine as slender and compact as possible, the electrical ancillaries and their drive units are fitted behind the crankshaft in the open space above the gearbox. The alternator, in turn, is driven by the primary gear on the clutch, developing maximum output of 580 W and maximum electric power of 50 Amps. The pre-shaft starter is connected to the engine by a freewheel drive unit operating on the alternator drive gear. Power transmission – reinforced multi-disc oil bath clutch, optimized cassette gearbox and HP Gearshift Assistant. differently at the rear and the shift forks come with a three-point rest replacing the former two-point base. To reduce weight, the hollow shift cylinder is made of high-strength aluminum alloy and runs in anti-friction bearings. The shift forks are made of steel and are lubricated by compressed oil. To reduce the length of the gearbox, the two gearbox shafts are positioned above one another. The gears themselves are in straight-tooth configuration benefiting not only the degree of efficiency but also the overall width of the gearbox. The K 1300 S features a new shift lever with an ergonomically optimized pivot point. Together with the likewise new anti-friction bearing for the shift lever this ensures an even more precise and faster gearshift than before. At the same time gearshift travel is even shorter and more dynamic. For the first time in the history of large-scale motorcycle production by BMW and, indeed, for the first time in series production worldwide, the rider of the K 1300 S is able to shift up with the help of the optional HP Gearshift Assistant without operating the clutch and, accordingly, without the slightest interruption of traction and pulling force. To perform this operation the ignition and fuel supply are interrupted for fractions of a second in the shift process. The HP Gearshift Assistant introduced for the first time on the HP2 Sport comes together with the sports footrests available as special equipment. Shaft drive to the rear wheel – optimized and quite unique in the sports segment. On the revised exhaust system of the K 1300 S the four individual manifolds of exactly the same length merge initially into two pipes beneath the gearbox and then into one single pipe leading on into an extra-large, newly developed rear muffler (4-in-2-in-1 principle). The muffler is significantly shorter than on the former model and now finished in sporting hexagonal design offers a capacity of 9.1 Litres(K 1200 S: 9.5 Litres) despite its short length and works according to the reflection principle. Both the outer skin and the all-new interior of the rear muffler now much lighter than before are made of top-quality stainless steel. The metal-based catalytic converter with 200 cells/square inch is integrated exactly at the point where the manifold merges into the rear muffler and comes with a coating of rhodium and palladium combining superior temperature resistance with a long service life. Full maintenance of the strictest noise and emission limits, despite the increase in engine power and performance, is ensured on the K 1300 S for the first time at BMW by a butterfly in the collector pipe electronically controlled and opening up the full cross-section of the exhaust manifold as a function of increasing engine speed. At low to medium engine speeds the variable cross-section remains relatively small to build up greater ram pressure in the interest of extra torque and pulling force, while the full cross-section opened up at higher engine speeds serves to develop maximum power and a sporting sound. Apart from making an important contribution to the even more muscular torque curve and improving the motorcycle’s riding characteristics in the process, the new muffler offers a powerful sound pattern full of character but nevertheless in full conformity with legal standards. And last but certainly not least, the hexagonal shape of the muffler allows the rider to lean over to a low angle in bends for a sporting style of riding pleasure. The entire muffler system made of stainless steel weighs a mere 9.4 kilos/20.7 lb (K 1200 S: 10.4 kilos/22.9 lb) and is therefore the lightest and most compact exhaust system with a fully controlled catalytic converter in this segment of the market. All other manufacturers require an exhaust system with two mufflers. The K 1300 S is also available with a very light and sporting slip-on muffler made of titanium and featuring a carbon cover as special equipment from Akrapović. The K 1300 S comes as an option with ASC Anti-Spin Control fitted at the factory and taking the significantly greater power and torque of the new four-cylinder into account. Particularly on a high-torque motorcycle and on road surfaces varying frequently, ASC is a very sensible addition to ABS, preventing the rear wheel from spinning when accelerating and thus losing lateral stability, which otherwise might make the rear end swerve out of control. By comparing the speed of the front and rear wheels with the help of the ABS sensors, the electronic control unit determines when the rear wheel is spinning, engine management taking back the ignition angle and intervening in the fuel injection process to reduce engine power accordingly. The particularly sporting rider also has the option to deactivate ASC while riding and is also able to switch off ABS as long as the motorcycle is at a standstill before setting out. Innovative suspension technology with optimized suspension geometry, springs and dampers. The suspension geometry of the new K 1300 S has been upgraded in the interest of even more neutral behavior in bends and an even higher standard of agility. This is achieved by modifying the wheel carrier in its production process and by the use of a Duolever with a newly designed lower longitudinal arm. With the K 1200 S entering the market in 2004 as the world’s fi rst production motorcycle to feature ESA Electronic Suspension Adjustment, the new K 1300 S now goes a step further four years later: As before the springs and dampers may be adjusted electronically at the touch of a button – but now the spring rate may also be modified by the rider. The front wheel suspension again features the Duolever launched in 2004 as another world-fi rst achievement, the lower longitudinal arm formerly made of forged steel being replaced on the K 1300 S by a new longitudinal arm made of forged light alloy. This reduces unsprung masses by approximately 1 kg in the interest of an even more sensitive and transparent response and steering behavior of the Duolever kinematics. The rear wheel suspension uses BMW Motorrad’s proven lightweight Paralever, the modified and now even firmer set-up of the rear spring strut taking the sporting and dynamic character of the K 1300 S into account. Together with the rider’s seating position, appropriate interaction of the suspension and the position of the engine ensures not only a low overall centre of gravity with ideal mass concentration on the new K 1300 S, but also perfectly balanced, ideal wheel load distribution of 50:50. As on the former model, the central load-bearing component is the main frame in bridge configuration. In this case the frame is a welded combination of internal high-pressure molded elements (IHM profiles) for the bent profile units at the side and extrusion-pressed profiles together with die-cast components for the frame head and the lower section of the swing arm bearings. The front suspension combines supreme stiffness with minimum weight, since the design and configuration of the wheel carrier may be freely chosen also in its contours due to the cast structure and may therefore be adapted precisely to the force curves. Appropriate wall thickness determined specifically according to local load conditions reduces the weight of the frame without forfeiting any strength or stiffness. And taking the main direction of forces into account, the longitudinal arms are set up mainly to absorb forces in their longitudinal direction, that is inbound and rebound forces, a structure which again makes them particularly stiff. The lower longitudinal arm previously made of forged steel is replaced by a light-alloy forging on the K 1300 S. Through its light but nevertheless extremely stiff configuration, this new arm guarantees an even more sensible and transparent response, at the same time reducing unsprung masses by approximately 1 kg. Hence, the overall structure weighs a mere 12.7 kg/28.0 lb, as opposed to 13.7 kg or 30.2 lb on the K 1200 S. The geometry of the spring strut pivot point follows a slight progression, with 115 mm or 4.52" of spring travel (60 mm/2.36" inbound, 55 mm/2.16" rebound). At 32 degrees right and left, steering lock complies with the usual standard in this class. EVO brake system and BMW Motorrad Integral ABS both featured as standard. The K 1300 S features the EVO brake system already well-known from the previous model and proven in the market everywhere, that is the same superior system also featured in BMW Motorrad’s other Boxer and K-Series models. The brake lines on the EVO brake system are clad in steel for extra protection, brake discs measuring 320 millimeters or 12.6" up front and 265 millimeters or 10.4" at the rear ensuring maximum stopping power also from very high speeds and under high loads. The EVO brake system has proven its additional qualities such as the extremely fast build-up of brake pressure and minimum operating forces even when applying the brakes all-out in many tests. Given all these qualities, the EVO brake system from BMW – EVO stands for evolution – is already acknowledged in the market as one of the safest and most effective brake systems available. The EVO brake system is featured as standard also on the new K 1300 S together with BMW Integral ABS likewise well-known from BMW’s other models, in this case in the particularly sporting and dynamic semi-integral variant. “Semi-integral” means that when pulling the handbrake lever both brakes (on the front and rear wheel) are activated while the footbrake lever acts only on the rear-wheel brake. Integral ABS was already adapted to the sporting configuration and style of the K 1200 S and has now been enhanced further in its control features. Since the sports rider wants to be able to dose the brakes smoothly and consistently with precise feeling, specifically this requirement has been taken into account, ensuring that even when applying the brakes all-out on the K 1300 S there is virtually no risk of the motorcycle toppling over. This is also due to the low centre of gravity and the particular geometry of the suspension interacting with the kinematic configuration of the Duolever. In other words, the rider is able to make full use of maximum tire grip also in the ABS brake mode, enjoying maximum safety even in an extreme braking maneuver. The K 1300 S boasts a brand-new generation of switches and manual controls also to be introduced on all upcoming BMW motorcycles. Using MID (Moulded Interconnect Devices) technology, the new switch units are far smaller and more compact and stand out through an even higher level of functional convenience, clear design and optimum accessibility. The formerly separated functions for the direction indicator lights left and right are now grouped in one and the same function on the left-hand side of the handlebar to avoid any confusion of the direction indicators and the horn. And as a further change, the hazard warning flashers are now operated by a separate switch within easy and convenient reach on the left-hand handlebar control. The functions for the low and high beam as well as the lights flasher are all combined in one switch easy to reach with your left index finger. To ensure even easier and more convenient operation, the knob for the handlebar heating has been moved up. And in accordance with practical requirements, the functions for the starter and kill switch are combined in one toggle switch unit, ensuring that even with inadvertent operation of the kill switch the starter with the ignition interrupted cannot be operated by mistake and subsequently empty the battery. Operation of the ESA II and ASC systems, formerly controlled by two separate switches, is now also combined in one toggle switch. Given this new technical configuration, the rider is able to operate twice as many functions as before with the same number of switches. This is an important factor in handling future equipment not yet known today, let alone fitted on the machine. To begin with, the switch operating the heated handles on the K 1300 S has been integrated in compact dimensions and within easy reach on the right-hand side of the handlebar. The indicator showing the current position of the handlebar heating switch, in turn, is now integrated in the instrument cluster display. The extra-light instrument cluster on the K 1300 S based throughout on digital technology comes with a newly designed speedometer and rev counter as well as the typical BMW Info-Flatscreen. This Information Display offers the rider permanent information on the temperature of the coolant, the remaining level of fuel in the tank, the time of day, and the gear currently in mesh. For very sporting purposes and competitive events, for example on the race track, the new K 1300 S may be equipped with the HP Instrument Cluster already well-known from the HP2 Sport as a special feature. Matching the sporting, dynamic appearance of the new K 1300 S, this is the first model in BMW’s four-cylinder series to be fitted as standard with a LED rear light in clear glass look. The use of light-emitting diodes taking the place of conventional bulbs guarantees unimpaired and maintenance-free operation, and extends the service life of the lights several times over. Thanks to its sophisticated ergonomic qualities, the sporting K 1300 S is fully suitable for long distances and grand tours. A new feature available for the K 1300 S is a luggage rack upgrading the all-round and touring qualities of the machine. Indeed, the new luggage rack supplements the existing baggage features already offered by BMW Motorrad in carrying all kinds of luggage on the motorcycle. Further customization is ensured by the usual wide range of options and special equipment from BMW Motorrad. Particularly the sports-minded rider will therefore enjoy the new K 1300 S even more with the HP Gearshift Assistant, the HP Info display as well as HP trim components made of carbon. Optional extras are delivered straight from the factory and are fitted during the production process. Special equipment is fitted by the BMW Motorcycle Dealer also providing a wide range of retrofitting options. Low rider’s seat (approx 790 mm/31.1", step arch length 1,750 mm/68.9"). • Luggage rack with installation kit. • Watertight tank rucksack (new). • Watertight tank bag including fastening elements. • Set of sports cases including case supports. • Sports soft bag, small, 19 Litres/large, 51 Litres. • Watertight luggage roll, 53 Litres, including fastening belt with tightening lock. • HP Gearshift Assistant (new). • HP Instrument Cluster (new). • On-board toolkit – service kit. • Paddock stand including adapter. • 230 V/110 V battery charger including adapter. • Repair kit for tubeless tires. • Repair instructions for K-models, DVD. • Heated grips with switch unit. • Low rider’s seat (approx 790 mm/31.1", step arch length 1,750 mm/68.9"). • HP rider footrests (new). • HP passenger footrests (new). • HP forged wheels, front (3.50 x 17") and rear (6.00 x 17"). • HP carbon seat cover. • HP carbon clutch cover. • HP carbon heat protector for standard muffler (new). • Akrapović sports muffler (new). • HP carbon tank cover (new). • HP carbon air box cover. • Electronic immobilizer with remote control. • Splashguard at the rear. • First-aid kit, large/small.• Motorcycle cover. • BMW Motorrad (Garmin) ZUMO navigation and communication unit, including support (new). 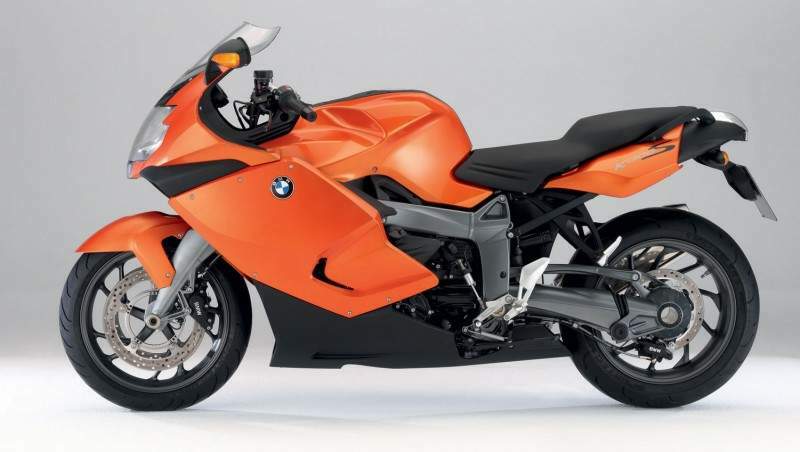 The color concept of the new BMW K 1300 S accentuates the unmistakable character of this new machine. The non-metallic colors form a strong and powerful contrast to the black surfaces at the front, giving the K 1300 S an even more compact and agile look from the side. The colors available are Light Grey Metallic and Lava Orange Metallic. The unique multi-color finish in Granite Grey Metallic/Light Grey Metallic with Magma Red highlights, in combination with wheels finished in Glossy Black, creates the sophisticated and striking look so typical of BMW and appealing above all to the sporting, performance-minded rider. The frame and suspension components on all color variants are finished in Asphalt Metallic.